Four minutes later and with tears of laughter streaming down my face, I started tagging all of my girlfriends in the comments section beneath the post. "If these ladies ever tour anywhere near us, we're going!" As a woman, I find these members of my "species" two of the funniest I have ever encountered. Their humor stems in part from the relatable topics they choose to discuss, but also from the authenticity of their relationship as friends and the banter between them. As a (often struggling) mother, I love Kristen and Jen's approach to both parenting and talking about parenting. They speak only the truth, at least the truth according to their experiences and a truth to which I can relate. They admit their mistakes and struggles in ways that make moms feel understood and less alone. And they laugh at themselves, which allows moms to do the same. I am working on a post about one of the worst parenting experiences I've ever had. The situation began when a stranger made a snap judgement about me and my parenting skills and ended with her yelling at me and calling me awful names in front of my children. Not a day has gone by since the encounter that I haven't thought about that woman; each time she pops into my head I question whether or not she was right in her assessment, remind myself she wasn't, and then get angry at her all over again, both for treating me the way she did and for making me doubt my ability to mother my children. 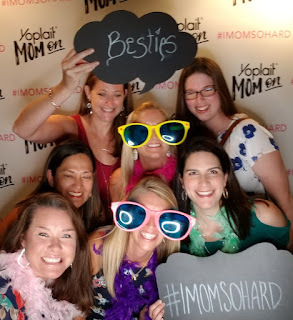 The women of IMSH talk frequently about how physically, emotionally, and mentally difficult it is to take care of kids, but also about how moms supporting - rather than judging and ridiculing - one another makes wearing the motherhood pants easier. Kristen and Jen regularly remind me that 1) there are many different ways to do this job well, and 2) most moms want to love on and make life better for other moms. The moment I found out about the IMSH tour I texted my friends: "I'M GOING NO MATTER WHAT. ARE YOU COMING WITH ME?!" All replied in the affirmative, and we bought our tickets within moments of them going on sale. The first IMSH tour has come to an end - the show we saw in Houston was one of their last - but should they ever tour again, I highly recommend making a date with your girlfriends (NOT your husband or significant other) to see the show. Keep in mind that the show content aligns with the content of the YouTube videos: raw and real and gritty and often inappropriate for anyone under the age of 18. Thank you, IMOMSOHARD, for a month's worth of laughs and an incredible night out with friends. something really creepy? Enlarge this photo and look at my eyes.